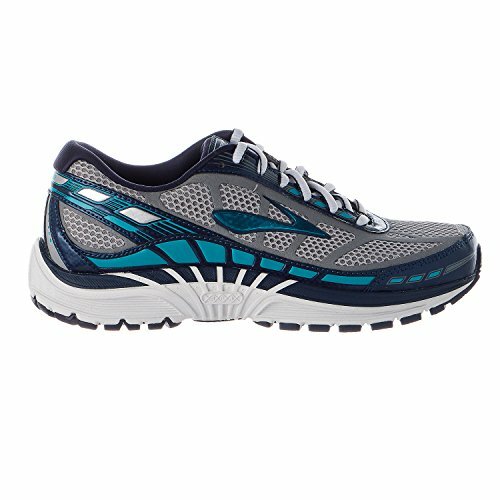 Feel your sole and shoe become one with the ride when you slip into the exhilarating plush of the Dyad 8 from Brooks®. Successor to the Dyad 7. Built for the neutral to underpronator who requires enhanced cushioning. Moisture-managing Element mesh upper offers protection from various elements while maintaining a breathable in-shoe environment. Durable synthetic overlays along with an adjustable saddle design for a snug, secure fit. Plush tongue and collar. Element linings are breathable and help wick away moisture to keep feet cooler and drier. Removable foam insole supplies light underfoot cushioning. BioMoGo DNA is a blend of earth-friendly BioMoGo and responsive Brooks DNA, and has a gender-friendly cushioning design, making for a dynamic ride. Full-length S-257 Cushsole midsole compound utilizes an insole board for increased cushioning and flexibility. Heel crash pad helps to ensure smoother transitions. Blown rubber forefoot offer light cushioning and grip. HPR Plus delivers long-lasting durability in high-wear areas of the outsole. Omega Flex Grooves allow for more natural forefoot movement and fluidity. Linear platform. Imported. Measurements: Heel Height: 1 1⁄2 in Weight: 10 oz Product measurements were taken using size 7.5, width B - Medium. Please note that measurements may vary by size. Feel your sole and shoe become one with the ride when you slip into the exhilarating plush of the Dyad 8 from Brooks®. Successor to the Dyad 7.